Also known as self-clinching flush head pins these pins are forced into an interference fit in a sheet substrate to provide location, alignment and hinging/pivoting functions. Usually produced in steel, stainless steel or aluminium and should be of a harder grade than the material they are fixed to. 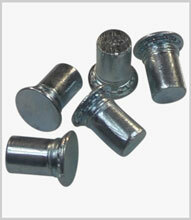 Many standard sizes – various lengths and diameters are available.